What does my Jewish community say about women? I can’t remember. For all of my time in Yeshiva, all of my holidays spent on long walks to synagogue, cooking, cleaning, serving, working, loving, crying and praying, I don’t think I ever stopped in my tracks to remember the last lesson I had in school on the women of the Torah who changed history. On Yom Kippur (the Day of Atonement), the rabbi at my synagogue made a speech about Chana and her seven sons. I was named after Chana, and I was elated to hear a story about the woman who once thought she was barren, and gave birth to seven boys. Yet, in my Orthodox synagogue, on the holiest of days, the rabbi spoke more about the boys. Chana’s story is one of the most devastating tales in the Torah. King Antiochus tries to convince Chana’s sons to give up Judaism in exchange for riches. When each boy refuses, the king tortures and kills them, one at a time, in front of their mother. The youngest boy is offered gold. When the child refuses, the king asks Chana to reason with the boy. What does Chana teach us by saying this? What did my rabbi think she was teaching us? I ask this question at the height of a fiery debate about women in this country. I go back to the story of Chana, and I revisit my role in synagogue on Yom Kippur in order to approach today’s holiday: Simchat Torah. Simchat Torah celebrates the new cycle of Torah readings. It is both an ending and a beginning. In my neighborhood, the Jews jump out of their SUVs and dance in the street with the Torah. This symbolizes a rejoicing in religion, a celebration of the word of God and of the Jewish people everywhere. Yet, as a Jewish woman, in my Orthodox synagogue, I am not permitted to touch the Torah. In my neighborhood, I am not permitted to dance with it. On Yom Kippur, my rabbi spoke about the dutiful sons of Chana. They were pious, good and wise beyond their years. Yet, Chana raised them. Chana’s devotion to God was her promise to God, one she never broke, even when watching her sons being tortured and killed. In synagogue I sit on the women’s side. Because it is an Orthodox synagogue, the men and women sit on separate sides. But this year I questioned the role of women in my community. This isn’t only because of the current political climate; it’s also because I have two daughters who I am raising in an interfaith household. Because of this I often ask myself what I should and should not be teaching/celebrating/learning. Should I sit in a synagogue that separates me, Chana, from the Torah? Should I carry on the tradition of my father, by attending an Orthodox synagogue, because it is just that: the tradition of my father. When is it time to make a change? What should I change when it feels like with my interfaith family I have changed so much already? When I was still pregnant with my first daughter, Helen, there was a terrible fire in my neighborhood. During Shabbat (the Jewish Sabbath), a family that lived two blocks away from my mother’s house left a hot plate on overnight. The electric wire caught fire and smoke billowed up the staircase killing seven children while they slept. The mother and oldest daughter jumped out the second floor window and were badly burned. The father was away in Manhattan on a spiritual retreat. The next day the bodies of the children were put into coffins and wrapped in velvet coverings to be sent to Israel. Over 3,000 people showed up to mourn the loss of such innocence in the community. When the father was interviewed he said, “I have sacrificed everything. Here, in front of you, seven pure sacrificial lambs.” I often ask about the family. “The father is doing well,” people tell me. “He has a renewed spiritual life.” Yet no one knows about the mother or the daughter. Where is she now? What is she doing on this high-holy-day? And if she asked, would they let her dance in the street? Would she want to? My goal for this new cycle of Torah readings, this New Year, is to hear more stories about women. How do we celebrate women in the Jewish faith? How do we celebrate them in the Catholic faith? 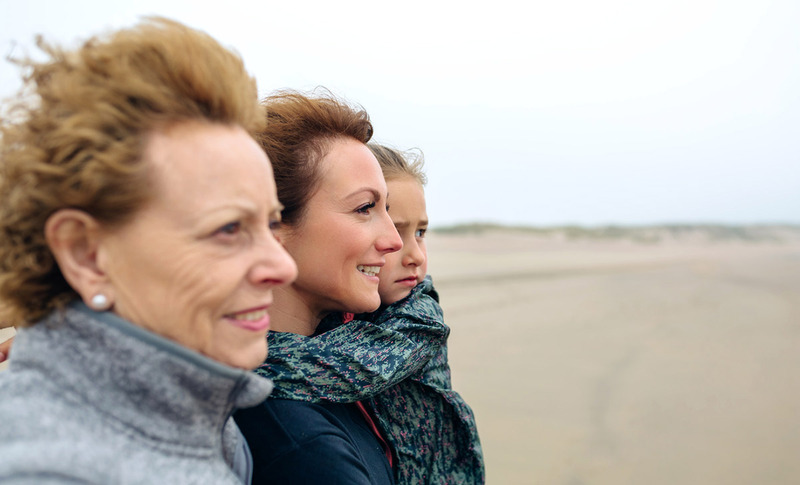 How can I celebrate my own daughters, my mother, my mother-in-law, myself? How can I celebrate the mother who lost her seven children to a horrible fire? How can I live a life as fierce and as fearless as Chana, so that maybe next year I can reach over to the men’s section and touch the Torah.